Bobbed into Lidl Birkenhead last night and couldn't find any baskets. When I asked a member of staff they told me that 197 of the 200 baskets they had been allocated have been stolen. Not an amazing heist but just gradually disappeared. Usually churn rate for these things is a few per cent not 96%. Is there a market for these trolley/baskets or something? Weird. I had the same situation at B&Q recently - was looking for one of those little wheelie baskets - all nicked, apparently. Presumably the cost of fitting an alarm that sounds when it passes a certain point is greater than the cost of a basket...? When my wife got her allotment, she was advised by several older plot-holders that supermarket trolleys made excellent incinerators. "They don't last very long, but hey are free, so..."
I can remember the time when they had fake bomb warnings in Asda (during the Irish troubles).. You've never seen so many loaded trollies rushing out the front doors without stopping. 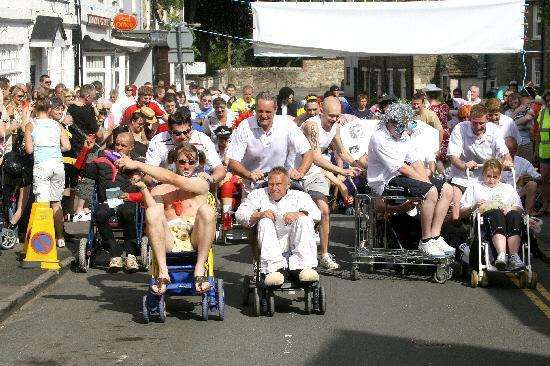 Maybe there's a 'pram race' in the offing somewhere. Last edited by granny; 27th Jul 2018 1:17am.